With projected online sales of €39,5bn for 2013 and an average annual growth rate of 23% since 2009, the e-commerce market is a beam of hope for the crisis-struck Southern European Region on its path out of the recession. Goods and services sold online in Southern Europe in 2012 amounted to a total value of €33,5bn, making up more than 10% of the total online sales in Europe, reveals the latest Southern Europe B2C E-Commerce report by Ecommerce Europe, the European umbrella organization for online retailers. Figures in Ecommerce Europe reports are based on the European Measurement Standard for Ecommerce (EMSEC). Southern Europe is a fertile ground for online retail activities: Of 128 million active internet users, 40 million are buying goods or products online. Online retail generates at present estimated 1,8% of total retail. The region, consisting of Spain, Italy, Turkey, Greece, Portugal, Croatia, Cyprus and Malta, has generated an e-commerce turnover totaling €33,5bn in 2012. Over the year 2013, an increase to €39,5bn is expected. With total e-commerce sales of €12,9bn, Spain is heading up the Southern European Region, ahead of Italy (€9,5bn) and Turkey (€5,4bn). With a year-on-year growth of 27.9% over 2012, the Southern European Region outperforms the European (+19%) and EU-28 (+18%) average. Turkey represents an enormous market potential, boasting a 90% growth rate over 2012 and an expected 40% year-on-year growth for 2013, thereby ranging ahead of all other Southern European countries in terms of growth. 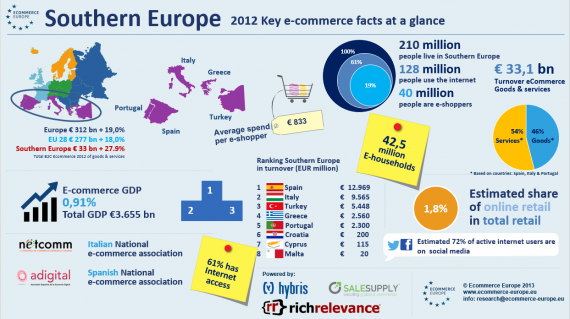 On average, Southern European online shoppers spent €833 throughout the year 2012. Average expenditure is thus below the EU28 average of €1.347 and the European average of €1.402. The Greek are the biggest spenders of the region, having generated transaction worth €1.347 in 2012. With an average expenditure of €864, the region’s largest e-commerce economy Spain only ranges fourth behind Portugal (€979) and Cyprus (€885). “As we can see from the results published in this latest Southern Europe B2C E-Commerce Report, the region is full of opportunities for online retailers: Spain is boasting the highest e-commerce turnover, but when we look at Greece, we see a pretty impressive annual online expenditure per capita in 2012, while Turkey’s growth rate in 2013 outperforms the European average by 100%. Now is the right moment to step in these markets and start growing e-commerce success”, says Wijnand Jongen, Chair Statistical Board Ecommerce Europe. Within the next few weeks, Ecommerce Europe will publish two other Regional Reports next to the Southern European B2C Ecommerce Report, regarding Central Europe and Eastern Europe, all with an outlook on 2013 projections. An abstract of the Western Europe B2C Ecommerce report can be downloaded online via: http://www.ecommerce-europe.eu/facts-figures/free-southern-light-version-report. The reports are powered by RichRelevance, Hybris and Salesupply.